Cat Adopts Rottweiler Puppy in my State of CT! In Meriden, CT at the CT Humane Society… a mother cat who just gave birth to kittens adopted a 6 day old Rottweiler puppy that was abandoned by it’s mother. The pup is named Charlie. Charlie’s mother was found by the side of the road in Meriden a couple of months ago. 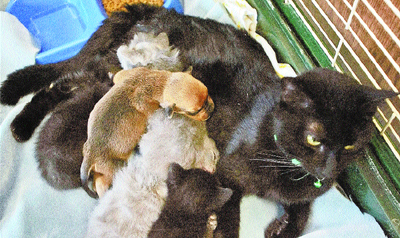 She gave birth to two puppies, but one was stillborn. As sometimes happens with a stillborn in the litter, the mother refused to accept Charlie. “The kittens scrum up with him and the kittens treat him like one of their own,” Chorney said. “There’s a certain social benefit of small animals being with each other.” Volunteers are hoping that dog owners will volunteer their puppies to be Charlie’s playmates. “Dogs need to be with a litter of puppies, to learn to play with other dogs,” Chorney said. “He has to learn to be a well-socialized dog. Here is the Meriden Humane Society’s website. Also, here is the article about the whole situation. Such a great story, I read about that last week and thought of you! I have some great pictures I need to e-mail to you! I had no idea that Rottweiler puppies are so cute. Thank you for the video, I wonder what will happen when he grows up, they will all be great friends. I wish to hear about them in following years, maybe someone will post video again. Who said animals can’t get along with each other. I just love to see things like that. I saw on tv awhile back-the opposite of this-a dog taking care of a kitten. I have read of dogs adopting kittens. This is the first I have seen the opposite. « Gang of Monkey’s Invaded Your Home? You’re Not Alone!